District Elder Henry Chauncey Brooks Lancaster, Sr.
District Elder Henry Chauncey Brooks Lancaster, Sr. is the Assistant Pastor at The Way of the Cross Church of Christ, Inc., where the Senior Pastor is Bishop Alphonzo D. Brooks. He is the oldest child of Evangelist Ruth B. Lancaster and the late Walter T. Lancaster, Sr. He has been a member of The Way of the Cross Church of Christ since his birth and for over forty-seven years, District Elder Lancaster has been married to Elect Lady Dorothy D. Lancaster. From this union were born four children and nine grandchildren. District Elder Lancaster has a very diverse set of skills,knowledge and talents. He served several years in the United States Armed Forces and retired on August 29, 1997 from the Washington Metropolitan Police Department after twenty-seven years of service. 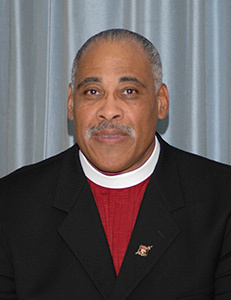 On June 8, 1958, Brother Lancaster was baptized in Jesus’s name by Elder Richard Ford, Sr; In 1976, Brother Lancaster was appointed as a Deacon and ordained in 1979; on October 17, 2000, Deacon Lancaster accepted his calling as a Minister; on August 11, 2006 Minister Lancaster was ordained an Elder, and then elevated to District Elder on August 3, 2012. It was only expected that greater things were going to manifest in his life and the fruition was evident when he was elevated to 2nd Assistant Pastor on February 21, 2010; and then Assistant Pastor on May 5, 2010. District Elder Lancaster has made unparalleled accomplishments within The Way of the Cross Church of Christ, locally, nationally and internationally. He has successfully bridged the gap domestically between The Way of the Cross Church of Christ located in the United States with other ministries in its surrounding community, in addition to internationally with several churches in Monrovia Liberia West Africa. While working diligently to nurture the churches in West Africa, without fail, he also faithfully oversees the daily responsibilities that come with the title of “Assistant Pastor” of The Way of The Cross Church of Christ, Inc.
District Elder Lancaster is a student and prolific teacher of the word of God and believes wholly in Proverbs 3:5-6 that we are to “Trust in the Lord with all thine heart; and lean not unto thine own understanding. In all thy ways acknowledge him, and he shall direct thy paths.” It is because of his obedience to God’s word, the faith he has in God’s promises and his undying dedication to the people of God that enables District Elder Henry Chauncey Brooks Lancaster, Sr. to continue to fight the good fight of faith and dedicate his life to the will of God. I am honored to be a part of this great family and pleased to be named after the founder, Bishop Henry Chauncey Brooks!